Most of the land within District is agricultural and is irrigated with groundwater. The only other source of supply is a very limited amount of surface water from purchases in wet years from the Turlock and Merced Irrigation District’s canals lying adjacent to the District, and from riparian water rights along the Tuolumne and Merced Rivers. The groundwater within District apparently is declining at a rate of nearly two feet per year which has created an average annual groundwater deficit of about 70,000 acre-feet. The advent of sprinkler irrigation in the 1950’s made irrigation practical in the rolling hills of the area that is now Eastside Irrigation District. In the 50’s and 60’s landowners invested in wells and sprinkler irrigation equipment to begin producing high value irrigated crops. As more lands were developed and more wells were drilled into the Turlock Groundwater Basin aquifer, groundwater levels began to drop. By the early 1980’s concern began to grow about the declining water table. The concern was that if the water levels continued to drop, a day would come when the wells would either go dry or water levels would drop to the point that it would not be economically feasible to pump groundwater for irrigation. After much discussion, in 1985 the decision was made to form the Eastside Water District so that irrigators could unite in a search for solutions to the declining groundwater levels. The EWD is comprised of about 54,000 acres in Merced and Stanislaus Counties farming high value, non-subsidized crops that are irrigated by highly efficient methods. 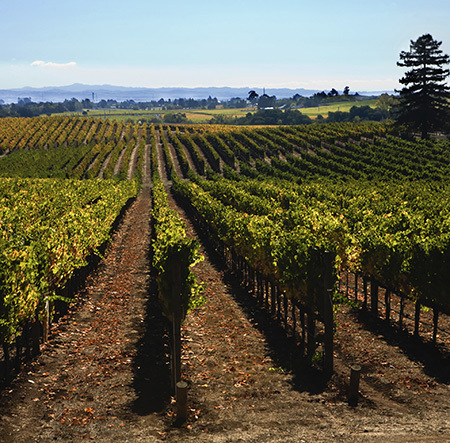 Most of the land within EWD is agricultural and is irrigated with groundwater. The only other source of supply is a very limited amount of surface water from purchases in wet years from the Turlock and Merced Irrigation District’s canals lying adjacent to EWD and from riparian water rights along the Tuolumne and Merced Rivers. The groundwater within EWD apparently is declining at about two feet per year, which is creating an average annual deficit of about 80,000 acre-feet. The new district began its search for solutions. The District retained the services of Boyle Engineering to prepare an Irrigation Water Master Plan. The plan, which was completed in 1990, examined options for reducing the decline and recommended that wells be drilled and that water be injected directly onto the aquifer. After further study and with the advent of new regulations it was determined that approach was not economically feasible. The search continued. By the early 1990’s statewide concern was developing regarding the status of groundwater in California, resulting in the California legislature enactment of the 1992 Groundwater Management Act (AB3030). AB3030 authorized agencies to prepare and adopt groundwater management plans to better manage groundwater resources within their jurisdictions. Subsequently, EWD joined the other agencies taking groundwater from the Turlock Groundwater Basin in preparing a groundwater management plan covering the entire Basin. EWD adopted that plan in 1997 as an addendum to its 1994 plan. In 1995 an incentive program to encourage irrigators to use available wet year water from the Turlock and Merced Irrigation Districts was developed and funded. Irrigators who signed up for the program were reimbursed $3.00 per acre-foot for actual water used. The program has been a success and has been extended on a year-by-year basis depending availability of water. Irrigators are advised of the availability of the program each year as the Irrigation Districts declare water available. The cost of studies to adequately determine the economic and environmental feasibility of groundwater recharge and to design and construct feasible projects exceeds the limited assessment authority of the EWD. In 2000 and 2001 the EWD made several unsuccessful applications for study grants from the federal and state governments. The District was formed in 1985, after about twenty years of struggle, in recognition that if the overdraft was allowed to continue unabated there could come a time when pumping groundwater for irrigation would no longer be economic, or the quality of water pumped would not be satisfactory for irrigation. The District was formed, by the election of landowners within the District, under California Law, as a legal body to address water needs of the area. The District is governed by a five person Board of Directors elected to serve alternating four year terms. In 1997 the District constructed a Pilot Recharge Basin near Monte Vista Avenue and very successfully operated it during the irrigation seasons of 1998, 1999 and 2000. In the late 1980’s the District retained the services of Boyle Engineering Corp. to conduct studies and make recommendations. An Irrigation Water Master Plan was completed in 1990. In 1994, the District completed a Groundwater Management Plan under California Assembly Bill 3030. The Plan identifies nineteen tasks to: monitor groundwater levels and quality, reduce pumping through improved conservation and further development of surface water/groundwater conjunctive use programs, and search for water supplies and methods to recharge the groundwater. In years 1995 through 1998 the District developed and funded an incentive program to encourage irrigators to use available wet year water from the Turlock and Merced Irrigation Districts. The District has joined other agencies who pump water from the common Turlock Groundwater Basin in developing and adopting a Basin-wide Groundwater Management Plan with the objective of coordination and joint efforts to stabilize groundwater levels. The basis for the now approved capital and operational water charges was illustrated in the October 22, 2015 ‘Water Charge Analysis Report’ completed by the Provost & Pritchard Consulting Group of Modesto. The period for submitting any property owner protest of these charges ended the day of the public hearing (December 17, 2015). After the final tally of protest received by the water district, it was determined that the roughly two-dozen protests received was less than 8% of the threshold necessary to delay implementation of the proposed charges. The water district Board of Directors acted in January 2016 to implement the initial capital charge for the 2016-17 fiscal year. Landowners will see this $30 per-acre charge in their tax bill this year. The initial operation charge will be considered by the water district and likely appear in fiscal year 2017-18 tax bills. In February, March, and April your Eastside Water District (EWD) Board of Directors developed its work plan for the 2016-17 fiscal year. An action by the Governor late in 2015 has given the EWD an opportunity to temporarily acquire a right to collect surface water from Mustang and Sand Creeks in addition to its plan to collect diffused surface water from Turlock Irrigation District’s (TID) Highline Canal. The Governor’s action allows EWD to secure a temporary water right for the creeks’ flow to help his statewide effort to store as much of the expected El Nino surface water flow as possible into the ground for the benefit of the groundwater aquifers. So, in addition to the projects proposed by EWD to date, applying for use of the waters from Mustang Creek and Sand Creek in associated projects to recharge the aquifer have been added to EWD’s project list. The quantity of water available from these added work efforts magnifies the impact of the original Diffused Surface Water Project (DSWP) by at least four-fold. In other words, assuming the DSWP on average would provide 2,500 AF annually to the aquifer; adding waters from these two creeks has the potential of adding on average over 10,000 AF annually. For this reason, the EWD Board of Director has directed its water consultant to pursue the temporary water rights as a first priority project. To be clear, the projects discussed in the 2014 and 2015 workshops leading up to approval of the DSWP are still expected to be constructed. These include diverting diffused surface water for field-flooding, and dry-well and basin direct recharge facilities. Due to the more effective projects proposed on Mustang and Sand Creeks, these projects have simply been delayed for a time. The EWD has also organized a Groundwater Sustainability Agency (GSA) formation committee; made up of interested governmental and non-governmental organizations located between the Tuolumne and Merced Rivers and east of the TID boundary. This work will also be funded by the water charges as previously explained. An initial meeting was held in March and a second meeting in April. The committee’s plan is to form the GSA well in advance of the formation deadline of June 30, 2017. If EWD landowners would like more information about the formation of this GSA or implementation of the Groundwater Sustainability Management Act (SGMA), you are encouraged to contact EWD’s water consultant (Kevin M. Kauffman, P.E.) at kauffmankevin@comcast.net or (209) 478-4940. The EWD Board of Directors is committed to addressing the overdrafted condition of the aquifer below its boundary through a logical and transparent process. The implementation of the capital and operation per-acre charges provides the funds necessary to earnestly begin this process. Each landowner is recognized for your efforts to be informed through this process and supporting EWD’s efforts in making this process a success. 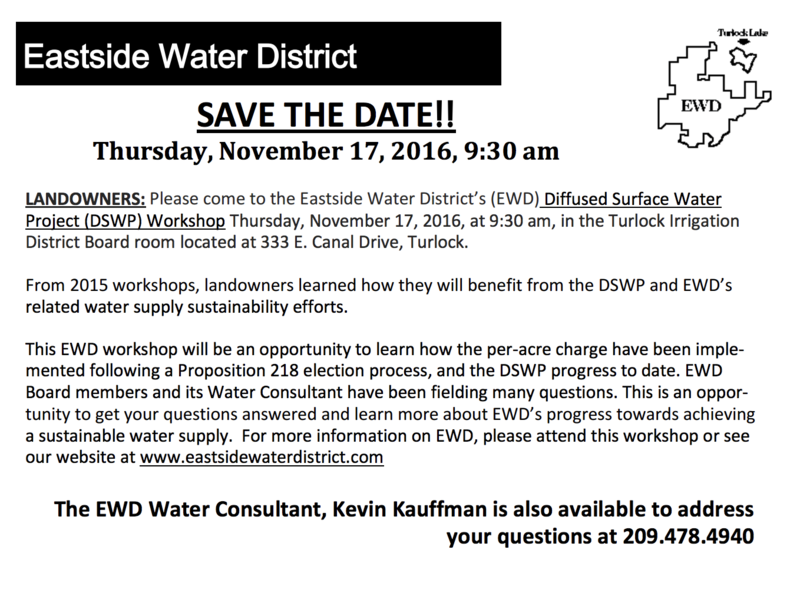 Periodically, EWD will provide updates on its progress with the DSWP, 2016 work plan, and future programs and projects. If you desire updates on a more regular basis, landowners are encouraged to attend EWD Board of Director meetings held monthly on the third Thursday at TID offices. 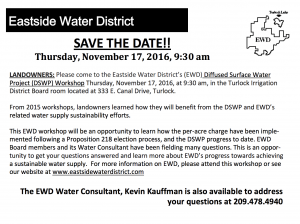 The Eastside Water District (EWD or District) is seeking landowner approval to support the funding of its Diffused Surface Water Project (DSWP) and the support of the formation of a Groundwater Sustainable Agency (GSA) for compliance with the Sustainable Groundwater Management Act (SGMA). The DSWP is intended to alleviate the current declining groundwater trends within the District’s boundary and to support a sustainable groundwater basin. Currently, the District is without a surface water supply and consists almost entirely of cultivated/irrigated agriculture with a substantial groundwater demand within the District. The groundwater pumping has caused a “cone of depression” and groundwater overdraft to occur. This is due to the lack a surface water supply that could offer groundwater recharge in the area and lead to a sustainable supply. Therefore, the District is seeking to implement a set of charges to be used exclusively for the development of a groundwater recharge program that will cover the costs of construction, operations, maintenance and administration related to the DSWP from pilot to implementation and the formation and implementation of a GSA.Download the entire document. 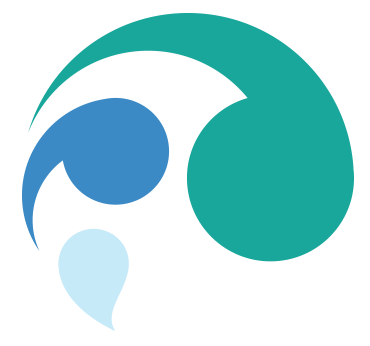 On this page you will find links to a variety of informational and educational water and energy related web sites. 2015 © Eastside Water District. All Rights Reserved.